Wondering exactly what you should write in your baby thank you card? Here are some tips for what to say when you want to express your gratitude to everybody that gave your new little bundle of joy, such a wonderful welcome into the world. 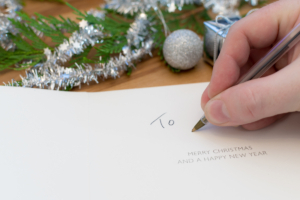 If you can, try to write the thank you cards as soon as possible after you receive the gift. This makes it easier for you (unless you’re the type of person that actually doesn’t mind writing 50 cards at once!) and it’s also nicer for the recipient to receive while it’s still fresh in their minds. You don’t need to be writing literary prose, just telling people sincerely and from the heart that you are grateful, is plenty. You also don’t need it to be the length of a short novel! Keeping it to a few meaningful sentences will be perfect. You could sign off by saying something like, “We look forward to seeing you soon, when we will be able to introduce you to little Amelia. Many thanks again. Lots of love, Sarah, Owen, Zach and Amelia…” It’s always nice touch to include all of the family names too. The person you are thanking will love receiving your beautiful card, and will feel very grateful for you going to the trouble of thanking them in such a thoughtful way.